Written to appeal to young and old alike, Dragons of Thin Air is an entertaining, insightful and comprehensive discussion for anybody who is afraid (or even just a little bit nervous) of flying. It is not your average self help book, however. If you hate taking medicine or fall asleep at the very thought of reading a textbook you will absolutely love Dragons of Thin Air. Yes, all the good Fear of Flying stuff is here (and more!) but weaving these topics together is a story. 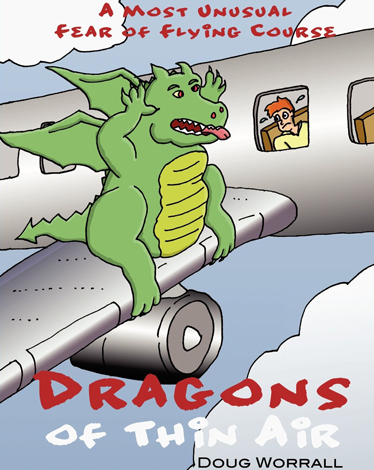 In this story a reformed Fear Dragon teaches a family of fearful flyers how not to be afraid. Such a helpful attitude, being somewhat against the dragon’s basic instincts, makes for a whole bunch of fun from start-to-finish. But, he does know fear — who better to run a course about fear than a dragon? Fear of Flying courses generally include some fairly standard content, and we’ve got all that good stuff; With nearly 200 illustrations you’ll find these topics presented so simply, so clearly and so believably that you’ll be absolutely astounded that nobody ever explained it that way before. Beyond these basics we explore some deeper issues such as how humans (as prey animals) are hardwired to feel fear, how the modern world manipulates us to enhance our fear, and the role of our imagination in the process. Even the contribution of our basic (poor) understanding of numbers and statistics is explained… Stop yawning! We don’t do it boring! And, to top it off, we provide a range of relaxation strategies and tools for the times when knowledge alone is not enough. 14: Where To From Here?